The popular Penultimate handwriting iPad app has been updated today, to Version 4.0. 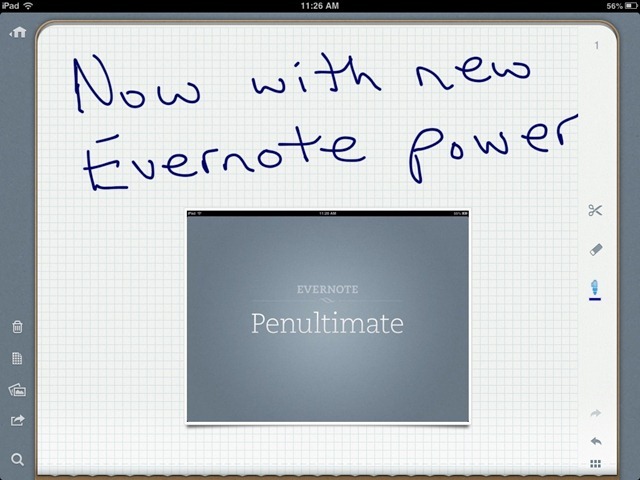 The app is now owned by Evernote, the most powerful and feature-rich note-taking app for iPad and iOS – and as a result this update brings some huge changes. We kept everything that millions of users love about the app, while adding powerful new Evernote features and refreshing the interface. Oh, and now it’s completely FREE! • Full Evernote sync: Save all of your Penultimate notes to your Evernote account to keep, view, and search them across every device where you have Evernote installed. • Handwriting search with Evernote: Evernote’s powerful handwriting recognition allows you to search your Penultimate notes. • Remember Everything: Evernote stores all of your Penultimate notes forever, ensuring that everything, from random doodles to important diagrams, are available any time you need them. • Redesigned: Now sporting a lovely new design. • Improved, sharper ink on retina displays. • More languages: Available for the first time in Russian and Traditional Chinese. This level of integration with Evernote instantly makes this app far more useful and far more interesting for anyone looking for a good handwriting app. And it’s now a free app. I have had Penultimate installed before but it hadn’t been around on my iPads for a long while. Today it’s back. This new version currently requires iOS 6 – though an update is on the way with iOS 5 support. Here’s an App Store link for Penultimate.